Zativo - How Are Magic Mushrooms And Magic Truffles Different? Magic mushrooms are probably the most well-known psychedelic in the world. A lot of people have experimented with them over the past millennia, using them for various purposes. Sometime in the past couple of centuries, psychedelic mushrooms became illegal in almost all countries in the world. Let’s try to understand how—if at all—magic truffles differ from magic mushrooms. Magic mushroom is the term given to a group of over 180 species of fungi with hallucinogenic properties. They contain a significant presence of psilocybin, psilocin, and baeocystin—substances that produce certain effects that are very attractive to humans. They start to appear in the mushroom at a very young stage, but it’s only in the last stage of growth that the mushroom will gain most of its potency. Psychedelic mushrooms have been a recorded part of human history for over 3,000 years, with numerous uses across various cultures. And they’re even theorised to be a contributing factor to the expansion of human consciousness after primates started including them in their diet. Magic truffles aren’t much different from magic mushrooms. They contain the exact same psychoactive chemicals, but are denser and drier than their mushroom counterpart. So anyone who tells you mushrooms are stronger than truffles has probably just had poorly grown truffles. Up until the second half of the 19th century, truffles were considered a separate organism from mushrooms. Only then was it proven that mushrooms and truffles are just a stage in the life cycle of the fungi. So, are they different or the same thing? Before we can understand how these two organisms differ, we’ll have to understand the growing process of a mushroom. Under the right conditions, mycelium starts appearing on soil or compost. This is a white, mould-like material that appears above and below the ground. This is the start of any psychedelic fungi. It’s the following process that decides whether the mycelium becomes a mushroom or a truffle. If everything goes right, mycelium will allow for the growth of mushrooms. But in case humidity and oxygen levels or nutrient availability aren’t ideal, the mushroom might not be able to grow. When this happens, mycelium will create an underground sclerotia, also known as a truffle. 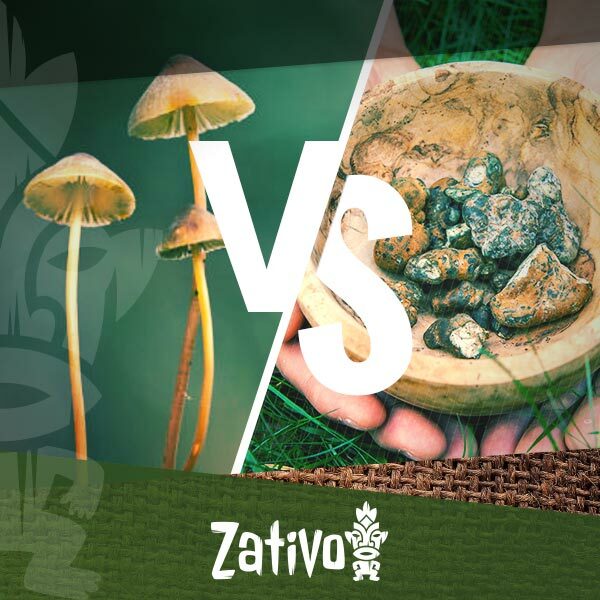 So, this is the real difference between them: the truffle is just a survival technique for when a mushroom cannot grow. There really isn’t any difference between a mushroom and a truffle. If both were given to you inside a capsule, you would not be able to distinguish the high. You’ll be able to distinguish them from the way they look and smell, but not by the way they hit. They both produce similar effects. The only difference is that the truffle will be a more consistent form for consumption. Mushrooms will increase their potency as they grow, therefore, poorly grown mushrooms won’t be as strong as properly grown ones. But the truffle doesn’t go through this. Once you’re comfortable with a certain dosage, you can trust that quantity to provide an equally powerful high next time. Even though the two forms of fungi share almost all traits, the legality issue is where they differentiate the most. Psychedelic mushrooms are illegal in a lot of countries in the Western world. When it comes to most of Asia, South America, and Africa, a lot of countries simply don’t have regulations for psilocybin mushrooms. But in the US, Germany, France, UK, Japan, and Mexico, it’s illegal to possess or sell magic mushrooms. In Brazil, Vietnam, and Jamaica, they’re legal to have and sell, but this is mostly because there’s no legal framework under which they are sold and regulated. As for truffles, they’re legal in a lot of places where mushrooms aren’t. This is because of the way the law is structured and what it specifies. In the Netherlands, after a girl fell from a bridge to her death while on shrooms, they were made illegal. But truffles, on the other hand, were not specified, and therefore have remained legal. In fact, they are readily sold online and in Dutch coffeeshops as part of the legal marketplace. In most places where you can legally carry and purchase truffles, it’s just because the law doesn’t specifically mention this subterranean body. Only in instances where the chemical compounds are illegal can there be any legal repercussions for the purchase and/or sale of truffles. If the law only specifies shrooms, then you’re allowed to have and consume truffles. We hope this has cleared up any doubts you had about these two psychedelic fungi. Just be sure to research well what the situation is in your country and municipality. » What Are Psilocybin and Psilocin?